Ballantine’s, the No. 1 Scotch whisky in Europe and the No. 2 Scotch whisky in the world, has unveiled a bold new-look bottle for its Finest expression, highlighting its suitability to the modern generation of whisky drinkers and ensuring it remains front of mind for customers. The new bottle will begin appearing in markets from July this year and embraces traditional Ballantine’s attributes such as timelessness, elegance and authenticity, while becoming more contemporary in style. This design evolution stays true to founder George Ballantine’s pioneering values and relentless pursuit of quality, never settling for less than the finest and travelling to the four corners of Scotland until finding the perfect blend of malts and grains for his whisky. With design elements including a chevron-shaped label that echoes the iconic wings of the historic Finest label, the new look gives the bottle a more dynamic, eye-catching look on shelf. 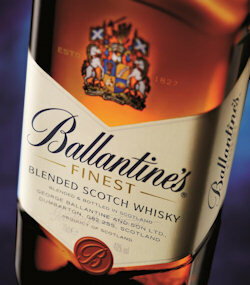 Premium quality cues have been enhanced through a more prominent positioning of the brand’s crest – the exclusive Ballantine’s Grant of Arms – and a simplification of the Ballantine’s seal, which amplifies the Ballantine’s ‘B’ and provides an opportunity to build on one of Ballantine’s greatest visual assets. ‘Finest’ also now features in a more premium gold colouring. 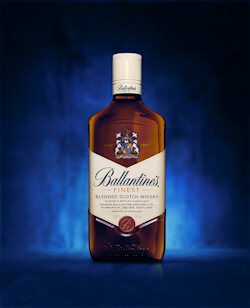 The Ballantine’s Finest carton will also reflect and emphasise the key features of the bottle; the chevron label, enhanced ‘B’ and the Ballantine’s crest, while the bottle itself will retain the iconic rectangular bottle shape that it is famed for, with its shoulders made more angular, resulting in a sharper, prouder look. The overall result is an iconic, contemporary design that is true to the Ballantine’s Finest brand essence and its original packaging, building on and enhancing its most familiar elements, which have led to its position as one of the most consistent and recognisable brands in the world. Peter Moore, Ballantine’s Global Brand Director, comments: “The Ballantine’s Finest bottle has changed very little over the years, but we recognised a need for the look to be updated, given Ballantine’s credentials as a famous brand that leaves an impression. We wanted to ensure that our new design stayed true to our proud heritage and identified with our loyal customers, whilst also being seen as a contemporary, vibrant brand, and we’re delighted with the final result. The new Finest range will be available in a wide range of sizes and formats and will be accompanied by a teaser ATL campaign. The ATL campaign contains two routes, with one focusing on the brand’s quality, consistency and originality under the strapline, ‘Always Original Since 1827’. The second route is more product focused with the strapline, ‘New Bottle, Same Great Taste’. An extensive range of point-of-sale materials has also been produced for Ballantine’s customers, including shelf talkers, neck tags, tent cards and cocktail cards, which will be available in bars and restaurants, encouraging customers to make Ballantine’s Finest cocktails at home. The new bottle also introduces Ballantine’s new global marketing campaign, “Stay True, Leave an Impression”, which acts as a reminder to the customer that acting with self-belief is what will leave a genuine, authentic and positive impression. The line will feature on all brand communications across all product variants, but with different features and nuances to reflect the range of products and varying customer groups.